Alberta Engine & Parts Ltd.
Not only do we supply parts, but we also have an inventory of complete used engines, ready to install. On average, we carry 100 engines of the above noted manufacturers, and our clients can enjoy substantial cost savings as compared with a new engine. Our engines are inspected and tested, and as well we powdercoat every block to provide a clean unit to our customer. Our engines carry a 30 day, 200 hour overall warranty, with a 90 day warranty offered for major components. Click here to know more about our Engines. Our clients range from individuals to service repair shops who are looking to rebuild their diesel engine, and are looking for a particular part at a cost less than what would be charged new. 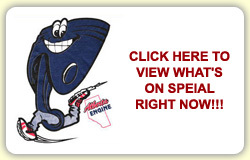 Alberta Engine & Parts is pleased to offer free delivery within the city of Calgary. Typically same day delivery can be arranged, and for larger orders, delivery can be arranged within three days of purchase. We are located at 64166 426 Ave. E, in Aldersyde, Alberta at our new base of operations. Our expanded facility will allow an even greater selection and inventory to service your parts or used/rebuilt engine requirement.